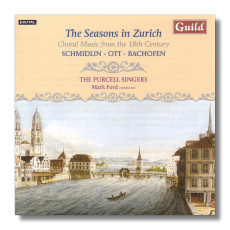 The enterprising Guild label is exploring the Swiss musical heritage with aplomb and this latest disc entitled 'The Seasons in Zürich' resurrects some unknown talents and brings them to the fore from undeserved obscurity. Johannes Schmidlin's mammoth 'Hymnus' receives a sparkling performance from the well-schooled Purcell singers. Although not the ultimate in creative quality, this work does deserve an airing for its lightness of touch and almost ethereal proceedings. Ott's lengthy oratorio entitled 'The Seasons' is somewhat more organized and at 43 minutes, it makes for some intriguing listening. The short piece by Bachofen is also very interesting and completes a very desirable disc. Guild's recording is clear and full with particular reference to the instrumentalists and full texts are also included. I would not hesitate to recommend this volume to the discerning choral enthusiast with a penchant for rare and overlooked composers.